When I wrote about Gorewad Monsters last month, I mentioned that the same guys who are behind those figures, Jimmy Rommel and Eric Nilla, also collaborate on a line called Universe of Violence. 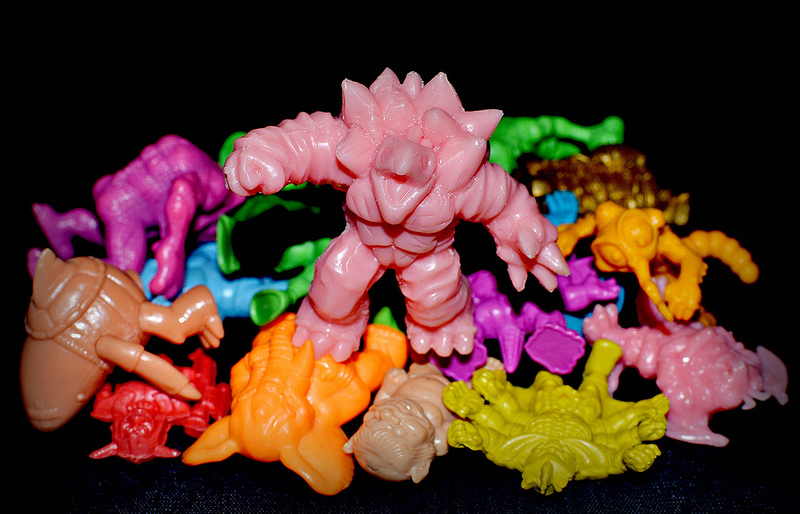 I also mentioned how out of the two lines, I was only collecting Gorewad Monsters. Well, damn. I knew that would only last so long. As soon as I laid eyes on the not-so-little little rubber guy above, Hell Turtle, I knew I had to finally take the plunge into the Universe of Violence. As you can see, this dude sports a fantastic sculpt done by Jimmy. The flesh/pink color of mine (colors are filled randomly) shows the impressive details very well. The spiky area behind Hell Turtle's head is awesome, and he's even got a little turtle tail sticking out of the bottom of his shell. Oh, speaking of his shell--it's freaking amazing! It could be my favorite part of the figure. Turn him around and you see that his shell is actually a big, demonic-looking face with sharp teeth, sinister, beady eyes and a cool, bumpy texture throughout. It looks so great that you might not be able to decide whether to display the figure facing forward or backward. The other major thing to mention is that when you place Hell Turtle on your shelf next to your other toys, you'll notice that he looks like a beast compared to most other little rubber guys. Probably the only other mini figures that look as threatening are some of the C.U.T.I.E.s... (I kid, I kid). The bulkiness of this figure is definitely part of what makes it so appealing. HT is a UoV "boss" and costs $16, and when you consider the size of the figures, the work that goes into making them and the fact that they are packaged with one of four bonus exclusive Gorewad Monsters (I got this one), the price is well worth it. Below is a photo of HT with some other LRGs so you can see what I mean (looks like he's about to eat Great Beast for breakfast, eh?). Now that I have Hell Turtle, I'm anxious to get some more Universe of Violence figures. And based on what Jimmy and Eric have said, it seems like there will be plenty of opportunity to add to the collection throughout 2013, with at least one new figure planned to come out each month (including another boss figure yet to be revealed, this time sculpted by Eric, that will be for sale next month). If you want to catch up on the Universe of Violence figures that have been released so far, including Hell Turtle and the six other sculpts from 2012 (plus the nine Gorewads that went up for sale last year), it sounds like you'll be able to do so via Eric's store through February, when they'll be retired to make room for the new stuff. Can't wait to see what else is in store for Universe of Violence this year!